Thomas Rhett is on the road again! Get ready, fans, for a night to remember as the "Life Changes" singer turns up the heat on his Very Hot Summer Tour! 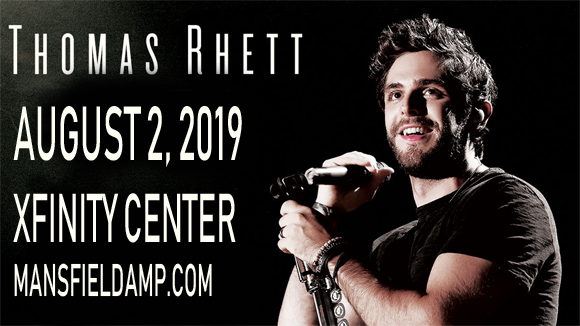 Coming to Xfinity Center on Friday 2nd August 2019, Rhett has been prepping all winter for this stint and, in addition to a full-power headline set, he'll be joined in support by Dustin Lynch and Russell Dickerson, along with his singer-songwriter father Rhett Akins! The son of country artist Rhett Akins, American country music singer and songwriter Thomas Rhett grew up around renowned country singers including Tim McGraw and Brooks & Dunn, getting his love for the genre early in life. In 2010, he co-wrote the song "I Ain't Ready to Quit" on Jason Aldean's album My Kinda Party, before signing with Valory Music (an imprint of Big Machine Records) in 2011 to embark on his own path as a performer. His debut single, "Something to Do with My Hands", was released in 2012 and was a Top 30 hit on the Billboard Hot Country Songs Chart, along with his next two singles. His debut album, It Goes Like This, followed in 2013 and was a Top Ten hit on both the Billboard 200 and the Top Current Albums chart. Rhett's third and most recent album, Life Changes, was released in 2017 and charted in the top spot on both the Billboard 200 and Top Country Albums charts.